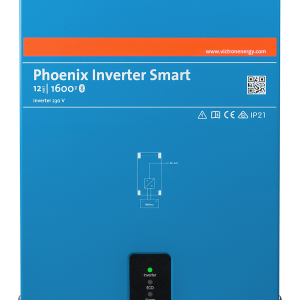 First of all it is the bluetooth accessory for our range of inverter/chargers: Multis, MultiPlusses, MultiPlus-II, MultiGrid, MultiGrid-II, Quattros, and our series of Phoenix Inverters with a VE.Bus port. 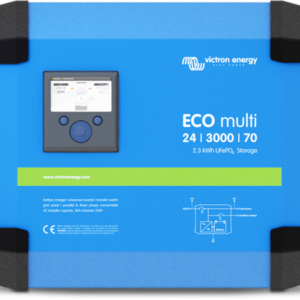 When installed, use the VictronConnect app to monitor operation and also operate the system: change the input current limit as well as switch between Off, On and Charger-only modes. 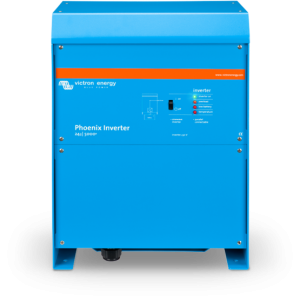 Secondly it adds Voltage- and Temperature-sensing to the inverter/chargers. 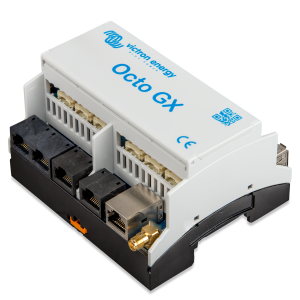 Work with all models, and is especially useful in combination with the MultiPlus-II, as it does not have onboard terminals for Voltage- and Temperature sense wiring. For monitoring, the device is a great alternative in caravans, smaller yachts and motor homes for which the Color Control GX or Venus GX are a step too far. 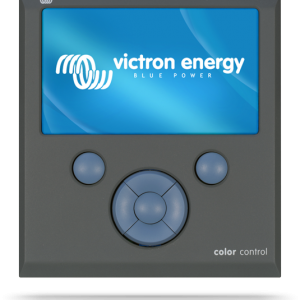 The Victron Energy VE.Bus Smart dongle is a Bluetooth Smart enabled VE.Bus interface, with battery temperature-and-voltage sensing. It communicates system information straight to your smart phone – using the free-to-use VictronConnect app. 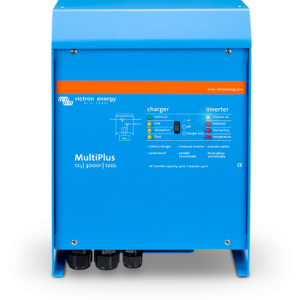 When used with Multi- inverter/chargers the dongle provides on-battery temperature and voltage sensing capabilities – allowing compensation for possible cable losses which can occur during charging and discharging. 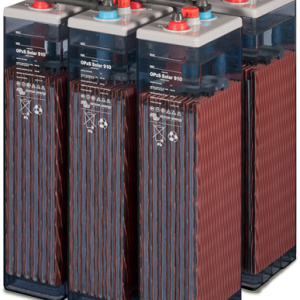 Temperature sensing allows accurate temperature-compensation during battery charge cycles. On MultiPlus-II models the dongle is, at present, the only way to add an “on-battery” sensing capability. 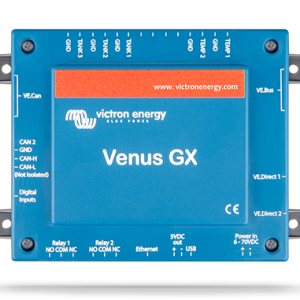 The dongle can be used in systems with or without a Venus device – such as the CCGX. In systems with a Venus device, the dongle will not override temperature and voltage information already being supplied by the Venus device – in this rôle the dongle will provide live-information via its VictronConnect interface; and it will provide no-internet firmware updates. 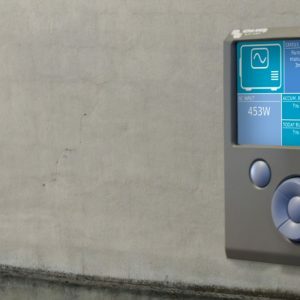 When the dongle is used in systems which do not have a Venus device, the dongle’s voltage and temperature data becomes the primary source of that information, and can be used by other connected devices for voltage compensation. Thus, the Victron Energy VE.Bus Smart dongle can be part of a VE.Smart network …sending voltage and temperature data to other Smart network devices. 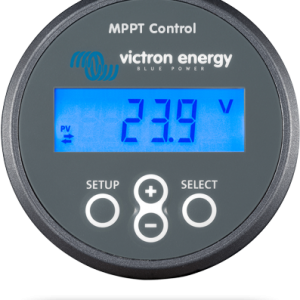 The Victron Energy VE.Bus Smart dongle is able to sense battery temperature in two ways: The default method is the dongle’s on-board temperature sensor. When the dongle is mounted directly onto the battery case (using its adhesive attachment) it will sense the battery temperature directly from the battery casing. 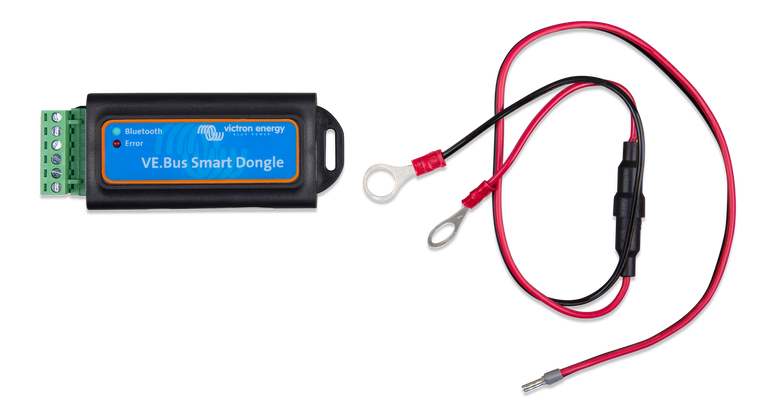 The second method – which provides improved battery temperature sensing – is available by using an optional battery-terminal mounted sensor. When this sensor is connected, the default sensor is overridden and the dongle will use this method instead. As indicated in the introduction the dongle can operate both as a primary and a background information source. It will assume either rôle automatically, and the rôle it adopts depends on whether a Venus device (CCGX/VenusGX/OctoGX) is present in the system. A Venus device has priority over the dongle and should always be able to access all data. When power is applied to the dongle – or after a firmware update – the dongle will startup in background mode. VE.Bus communication ports will be monitored for 30 seconds. If during this time no Venus device is detected the dongle will switch to primary mode, and all supported data will be available. 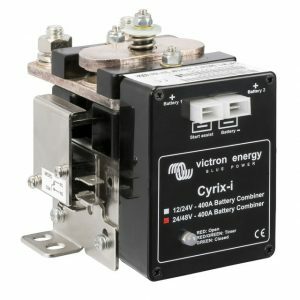 While switching modes VictronConnect will temporarily indicate an “unknown” VE.Bus state. The dongle continuously monitors Venus device activity on the VE.Bus. As soon as a Venus device is detected it will switch itself to background mode. 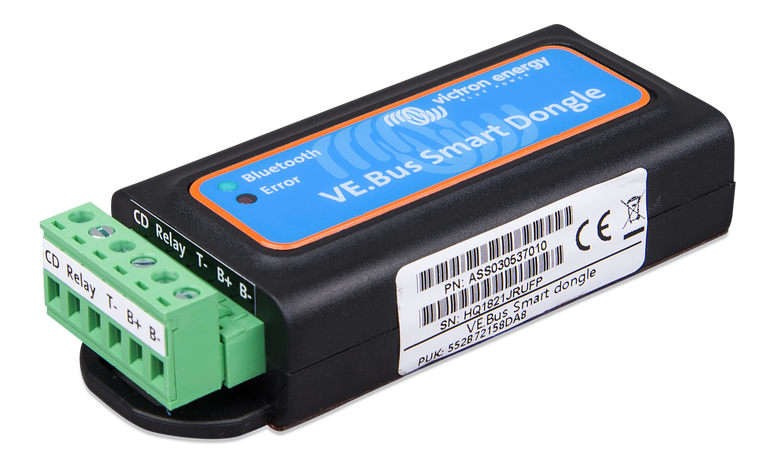 Likewise, the dongle also monitors VE.Bus communication in order to discover if a Venus device is supplying the Multi with battery voltage and temperature data. It takes around 4 minutes after power on, or reset, before the dongle decides whether or not to transmit the battery voltage and temperature. When no Multi is connected VictronConnect will list the ‘VE.Bus Smart Dongle’ in the device list. In this case the dongle can be used as a Voltage/Temperature sensor.